We signed on with vocalogic who merged or was bought out by claritytel. We lost services we had before no but still pay the same price. We were happy before but have been very unhappy since the merge. Everything feels janky and cheap now, especially on the call in where they hear Fisher Price music where we had advertisements on hold before and caller ID went away so we can’t greet our clients with the proper personal answer method. Phones reset randomly for no reason now. Pros: Easy to use system anywhere there is an Ethernet pretty. Cons: Expensive and somewhat unreliable. I switched to ClarityTel in February of 2017, and my phone service has been wonderful. I can now route my calls without any incidence or glitches. Minor problems, due primarily to my own incompetence, were quickly solved by ClarityTels technicians. When you call, a human answers. You are sent immediately to tech support. If they don’t answer immediately, they call you back in the next ten minutes and bingo, you are back in business. The dashboard is clear and easy to understand. Everybody there is friendly and willing to help. I would recommend ClarityTel to anyone. They are reasonably priced, honest, capable and efficient. I switched to ClarityTel in February of 2017, and my phone service has been wonderful. I can now route my calls without any incidence or glitches. Minor problems, due primarily to my own incompetence, were quickly solved by ClarityTels technicians. When you call, a human answers. You are sent immediately to tech support. If they don’t answer immediately, they call you back in the next ten minutes and bingo, you are back in business. The dashboard is clear and easy to understand. Everybody there is friendly and willing to help. I would recommend ClarityTel to anyone. They are reasonably priced, honest, capable and efficient. Pros: Fantastic Service, Great Product. 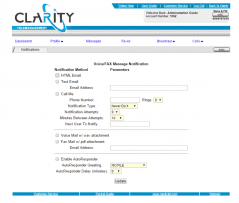 ClarityTel Business VoIP comes in many flavors ITSP SaaS. I have been a customer of this company since 2006 and have gone through the telecom revolution with them. They have every time done what they promise. 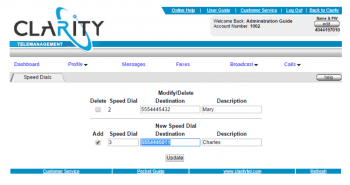 Claritytel.com delivers hosted VoIP telephone service as well as hosted PBX. I sell an on-premise solution and use their SIP trunking service extensively. I have never had a problem with interoperability, and have integrated Nortel, Avaya, and Asterisk based phone systems with Claritytel.com The developers and technical staff are reachable, personable, and competent . In a couple cases my customer wanted something special to be added to the platform. Within days I received an email from the head man in development stating it was ready! 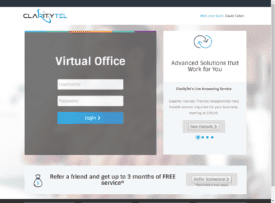 ClarityTel Business VoIP comes in many flavors ITSP SaaS. I have been a customer of this company since 2006 and have gone through the telecom revolution with them. They have every time done what they promise. 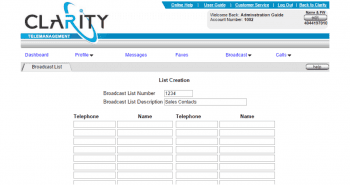 Claritytel.com delivers hosted VoIP telephone service as well as hosted PBX. The developers and technical staff are reachable, personable, and competent . In a couple cases my customer wanted something special to be added to the platform. Within days I received an email from the head man in development stating it was ready! Pros: Rock solid. Multi-redundant in hardware, power, PSTN interconnect, and geographically. There has not been a serious service affecting outage - better than 5-9's. Used services for years without any problems and have recommended it to thousands of others. It is effective, efficient and affordable and allows me to focus on other priorities in my business. Pros: Gives me the flexibility and innovation I need. 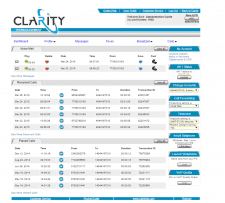 I transferred approximately 20 accounts to ClarityTel. The process took several months, mainly because the telephone company I transferred from was very uncooperative. Throughout the transition, Derrick Carswell stayed on the case and remained completely responsive to my needs and the needs of my customers . This included after hours and weekend attention when necessary. In any introduction of a new technology to customers who are used to doing things a certain way, you’re going to have questions and perhaps some misunderstandings. I’ve got to say that with the intense focus on this block of customers, service disruptions were kept to an absolute minimum. Several years have now passed since the cut over to ClarityTel. As proof of the usefulness of the software along with it’s ease of use and functionality I am happy to report that practically all of the customers involved have remained on the service. ClarityTel offers a great service at a very fair price. I am very pleased that I chose to place my customers on their platform. Their systems are highly capable and extremely reliable. I couldn’t ask for more. I transferred approximately 20 accounts to ClarityTel. The process took several months, mainly because the telephone company I transferred from was very uncooperative. Throughout the transition, Derrick Carswell stayed on the case and remained completely responsive to my needs and the needs of my customers . This included after hours and weekend attention when necessary. In any introduction of a new technology to customers who are used to doing things a certain way, you’re going to have questions and perhaps some misunderstandings. I’ve got to say that with the intense focus on this block of customers, service disruptions were kept to an absolute minimum. Several years have now passed since the cut over to ClarityTel. As proof of the usefulness of the software along with it’s ease of use and functionality I am happy to report that practically all of the customers involved have remained on the service. ClarityTel offers a great service at a very fair price. I am very pleased that I chose to place my customers on their platform. Their systems are highly capable and extremely reliable. I couldn’t ask for more. Pros: The software has a high degree of functionality and adaptability. If a customer has a particular need, this need can almost always be met through already existing features or ClarityTel's flexible programming ability. Their name may not be the most immediately recognizable brands in the VoIP and Unified Communications industry, but ClarityTel is still a leading VoIP service solution provider. They have been in the industry providing VoIP software solutions since 2003, and has grown over time. With thirteen years of experience under their belts, ClarityTel has continued shape their own service solutions, a unique spin on the Hosted PBX solution, to the small business market. With their own unique pricing model, ClarityTel offers some of the same services that most Enterprise level providers include in their solutions – such as the usual 35 calling features that accompany a cloud based system, such as unlimited calling, or an even more technical auto attendant. However, with their own pricing model and unique advanced features tailored to the small and medium business owner, ClarityTel certainly has made a name for themselves, enough to stick around for 13 years at least. The provider’s entire catalogue of advanced features, combined with a robust, reliable nationwide network and 24/7 customer service and tech support, offers a price conscious solution for the smaller, or even medium to large, business in need of more than just a basic cloud telephony or unified communications solution. ClarityTel offers three different size tiers, each with their own pricing point and allotted lines. ClarityTel might not be the most instantly recognizable name, but when it comes to outfitting your small or medium sized business with a price conscious, and feature packed service they are absolutely worth taking the time to consider. While their voice plans cap at 50 lines, any business that fits into that segment might want to take another look at ClarityTel’s pricing. With one flat fee that includes unlimited calling, as well as such a massive list of features, they offer a very compelling service solution. The ability to further customize your plan allows a business to either keep it cheap and simple, or tack on some very unique advanced features that can truly benefit any business with the correct use case. Unique advanced features like ClarityTel’s Store Locator Service will not fit into every single business use case, those that can and would benefit from such features will probably feel at home with ClarityTel. For example, the Store Locator Service will assist inbound calling customers to quickly connect to the correct store on your business’ network. But if your business is just one team in one office, then other advanced features Receptionist Call Manager might be useful – this provides a professional SIP softphone client for operators and receptionists. The client will also directly integrate with your e-mail or CRM app so your receptionist will stay on top of everyone calling in to make appointments. ClarityTel also offers an Advanced Auto Receptionist for when the basic system just won’t cut it, as well as call recording, Voice and Fax broadcasting and even a live answer service so you can always have a real, alive person answering your phone. These unique advanced features are an easy way for even the smallest business to boost their image to an Enterprise level, fortune 500 company. Not every business will require or benefit from each one of these services, but that is part of the beauty of ClarityTel’s offering – they don’t charge your business more money for features you don’t need, but rather let your business customize and tailor a plan. These features are also slightly unique, such as the Live Answering Service and Store Locator, and make a lot of sense for a small or medium sized business looking to boost their image, while keeping costs low and customizing the plan with unique advanced features to fit their business’ needs. What Do You Think of ClarityTel?